Submitted by rocknicehunter on Tue, 07/28/2009 - 3:38pm. This POI file contains the locations of the last three remaining "Wig Wam" motels. The first one was built in Horse Cave, Kentucky in 1933 by Frank Redford. In 1936 he was awarded a patent on the design. Seven of these Wigwam Villages were constructed across the country between then and 1950. While not "politically correct", they provide a unique place to stay and offer a small insight into the past history of the early years of "road travel". 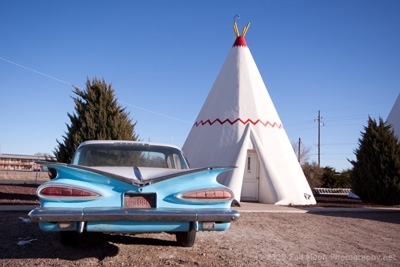 In addition to these three a similarly themed, but unrelated motel, Tee Pee Motel in Wharton, Texas, is also included. This motel, originally built in 1942 was renovated in 2006. The file includes the address, phone number and website url.